How sure are we that Russian Kettlebell - 36kg (79 lbs.) will work for you? Simply fill out the form below and put Russian Kettlebell - 36kg (79 lbs.) to work for you right now. 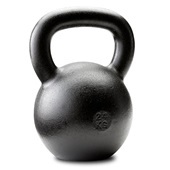 Obviously, we would go out of business if Russian Kettlebell - 36kg (79 lbs.) didn't work, the way we said, right? With the promise of a full refund if you're unsatisfied, you have nothing to lose by trying Russian Kettlebell - 36kg (79 lbs.). Go ahead and try it today. 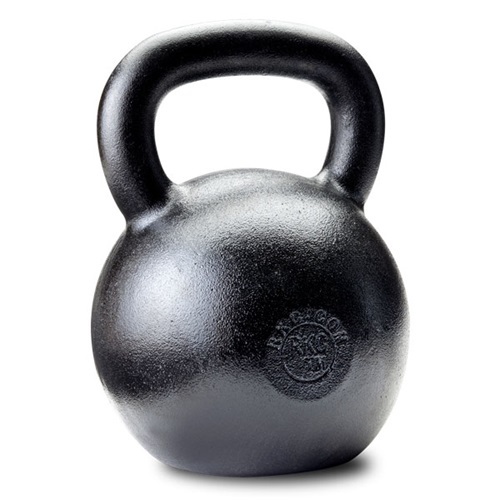 Dragon Door has designed this 79lb cast iron kettlebell—for those men wishing to develop severe overall strength. 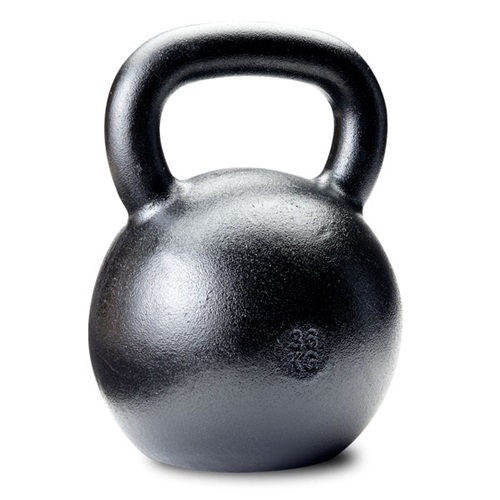 The 79lb kettlebell brings another level of nastiness to those who require it to stay on top of the heap: martial artists, football players and other athletes for whom explosive power and egregious strength are a MUST. Want to make the Greek Gods look mediocre? Regular practice with 79lb kettlebells will give you the etched magnificence and physical proportions of the old-time strongmen—and have Hercules crying "Uncle!" 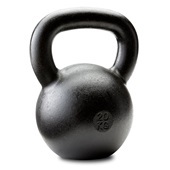 Men: you will probably start with Dragon Door's specially designed 35lb kettlebell, and then move up to the 53lb kettlebell, which will become your staple. However, if you wish to move into the front ranks of physical excellence, make it your goal to incorporate 79lb kettlebells into your workout programs. Men, to make sure you take full advantage of your 79lb kettlebell, get the landmark book and DVD, Enter the Kettlebell! They call the 106 lbs. RKB the Beast, well meet the "Little" Monster. This 79 pound RKB(yes I said 79 pounds!) is, to be polite, portly, squat and just plain beautiful! It just screams the word solid! I refer to it as a 53 pounder on steroids. It is awesome! One leg standing rows and one leg dead-lifts take on a whole new meaning with this thing. High-pulls become a new form of torture. What to test your form on snatches? Use the "Little" Monster and find out real quick if it is perfect or not! Get-ups, C&Ps, MPs, Swings, Snatches, you name it, it becomes deliciously painful. Swings will really work your grip with this evil Russian! I think this 79 pound size will really take off. It is the usual Dragondoor top quality product that we have all come to expect from Dragondoor. So order up Comrades, thats an order! You won't regret it. 1. Handle finish - This kettlebell arrives with a smooth, round handle with no burrs or blemishes. I cannot say the same for my others. 3. Uniform bell shape - I am not sure why "sphere" is hard to get right when casting a kettlebell, but apparently it is. Dragon Door nails it. 4. Distance from handle to bell - My Power Max kettlebells have too much distance between the handle and the bell. This results in my 28kg Power Max bell being taller than my 36kg Dragon Door bell. There is a much different feel when using a kettlebell with a shorter handle, and I prefer it. I am glad I bought this one. As my finances allow, I will trade out my off brand kettlebells for Dragon Doors. This has been an excellent piece of equipment for me personally. It has allowed me to start bridging the gap between some things I could do with the 70 lb. kettlebell, but not quite do with the 88-pounder. Like snatches, clean and (strict) military presses, high windmills, and 1-handed swings. In time I expect to be able to do all of the above with the 88-pounder. I doubt I would have ever closed this gap otherwise. I ordered this bad boy a few months ago, and after some good training with it, am now ready to take on THE BULLDOG. I'd highly recommend this one!!! I've been using kettlebells for 10 years now and this bell is excellent. Wonderful quality as only Dragon Door can bring, and a great size for working out my gluteus with some deadlifts. I'm a lady, so readers, don't assume this bell is only for the guys! 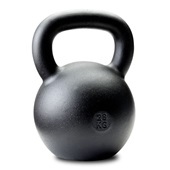 I got an old version of the 36kg kettlebell which is much different from the new version. The handle was rough and 3/8" thinker than the newer version. The logo is different and the "36kg" marking on the bell could not even be read. This would not be a concern except that I have a full set from 10lbs - 32kg plus one each of 36, 30, 44,and 48kg all the newer version (smooth finish, nice handle, and great looking logo and lettering) so I was hoping for one to match my set. I sent the bell back in exchange for what I was told by customer service will be a newer version however I got another old version bell which was worse than the first. Finally I was told by customer service that they would refund the bell but I will have to pay for shipping which is $50 . I don;t think I will send the bell back but will try to sell it instead and search for a newer version 36kg maybe from a distributor. The 36kg (79 lbs.) 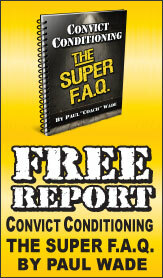 has played a pivotal part in my strength training. It is the vehicle that bridged the gap between working with the 32 kg (71 lbs.) and the 40 kg (88lbs.). To say the least, an increase of seventeen pounds in a kettlebell is a difference in light years. I highly suggest adding the 36 kg. to your arsenal of bells in order to progress into your heavier bells such as the 40 kg. The 36 kg. provides for a heavier load that will allow you to execute proper loading perimeters and technique. Rated 10/10 The bigger the better! With a lot of other kettlebells as you go up in size the quality of finish and shape goes down, not with RKC. I just picked up 2 of these from a local distributor, I think they are old stock, the bells have the almost grey coating that some of my other RKCs have. I like this finish the best it has a very even texture and looks great! By Tracy Warren / Waynesboro, Tennessee, U.S.A. It's a good tool. I'm not sure of the finish as I had a spot of rust about 2 inches diameter within two weeks. No problems I guess. I'm sure I will order a 40 kg soon.